The new year has started and a lot of us are in the process of creating goals for the new year. Among the most popular goals that people set for themselves just about every year is to get rid of debt, and get into a better place financially. I know my wife and I have made that a goal of ours in the past, and thankfully we've been able to get rid of all non-mortgage debt as of a few years ago. I still remember the weight that lifted off of my shoulders when I made that last student loan payment, and wrote the last check to pay off my wife's wedding ring. It was a feeling of finally being free, and of having virtual chains fall from our wrists. It's an amazing feeling. 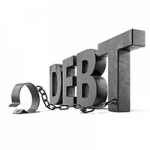 Being in debt can be a huge strain and can completely weigh you down. Debt has a way of taking over your life, there's a reason why so many divorcees list “money problems” as a source of tensions. Because debt can have such an adverse affect on people's lives, today I want to talk about a group that is hoping to encourage people to take that first step and get rid of debt. It's called the Debt Movement, and it's brought to you by Jeff Rose of GoodFinancialCents.com. Here's a heart-felt introduction to the movement from Jeff himself talking about why he started it. 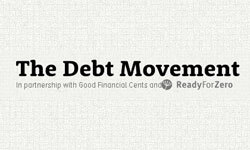 Time To Get Rid Of Debt: Join The Debt Movement! So How Can You Join The Debt Movement? Debt is insidious in that it can sneak up on you and completely throw your financial plans off course before you even realize it. For me the debt took the form of thousands of student loan debt, credit card bills, auto loans and several thousand dollars to pay for my wife's engagement ring. For years my debts were always there, hovering in the background. All my extra money most months was going towards paying off those debts. We just didn't have a lot left over to save. My wife and I determined that we didn't like living that way – month to month – debt to debt – and we decided to make a change. We joined Dave Ramsey's Financial Peace University, and over the course of the next year or so we paid off all of our debts. I can't even describe how good it felt to finally pay off that last student loan. It was like a weight lifted from my shoulders and a whole new world of possibilities opened up! The problem with debt is that far too often the things we're buying with borrowed dollars just aren't worth it, or could have been bought debt free with a bit of patience or hard work. For example, the cars that we bought using loans, we could have saved money and bought them without debt by starting smaller and buying a more affordable, older car. We could have then worked up to something nicer by saving up for our next car. That's the course we take now having bought our last three cars for cash, but back then we did the “normal” thing and bought our cars using financing. When I was in college, I could have forgone the use of credit cards, but instead I bought a bunch of worthless stuff that I no longer have or need using high interest credit. In the end I paid far too much for those items when you factored in all the interest that I paid. I could have put that money to much better use if I hadn't gotten into debt. In case that didn’t sink in, let me repeat myself. We are going to help people pay off $10 million of debt in 90 days. The Debt Movement is more than just a big number. It’s about giving people the tools, the motivation and the belief that they can finally taste financial freedom. When you're in the midst of getting out of debt, it can be overwhelming. Because of that Jeff decided to initiate the movement to help give people the motivation and tools they need to stay on track. Joining in the movement is easy. First, join with the community and commit to paying off debt. You can join in by clicking on the “Join us” button on the widget at the bottom of the page. Step 3: Track Your Progress – 1) At minimum we will be sending out a survey twice a month to see how your progress is doing. We will expect you to be as honest about your progress as possible. Winners are not solely based on total debt paid off, but also the ability to show poise and determination through financial setbacks. 2) Keep track of all your debt paid off. The easiest way is to use ReadyForZero. Why? It’s free! If you prefer not to, then you’ll be able to let us know how much you’ve paid off with the survey we email you. You can also get involved the Debt Movement by asking questions of the experts in the Debt Movement forum, joining in the Twitter chats and Google Hangouts to win prizes, and by dedicating yourself to getting rid of debt. So without further ado, let's get started! 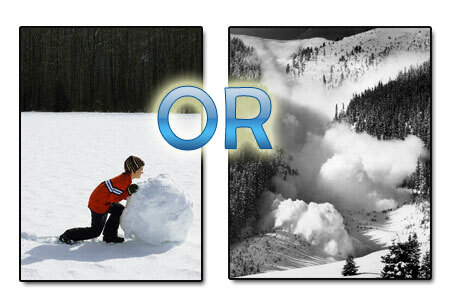 Head on over to The Debt Movement site and join in making 2013 the year that your debt started to disappear!